Today Friday is Groundhog Day, meaning the town of Punxsutawney, Pennsylvania, nudged its resident groundhog folk climatologist, Punxsutawney Phil, out of his burrow to determine if warm weather is nigh. According to tradition, if the groundhog sees his shadow, that means six more weeks of winter; if he does not, it means an early spring. 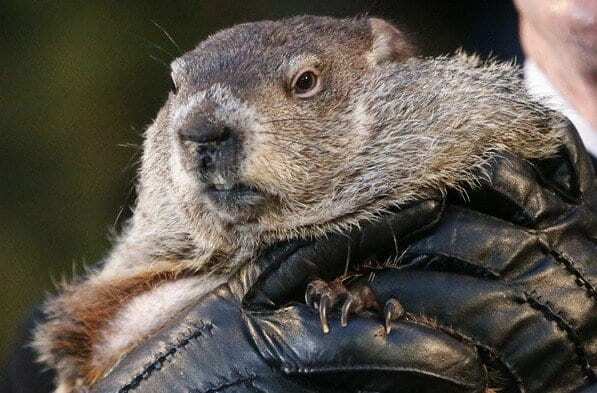 In fact, Phil’s handlers just had him pick a scroll, and to boos from the crowd, the groundhog picked the scroll that predicted six more weeks of winter. Not to worry, though — since 1988, Phil has been right 14 times and wrong 16 times time. Based on weather data, “there is no predictive skill for the groundhog during the most recent years of the analysis,” NOAA’s National Centers for Environmental Information noted this week. This entry was posted on February 2nd 2018 at 8:23am/08:23 and is filed under Live News Column 1. You can follow any responses to this entry through the RSS 2.0 feed.